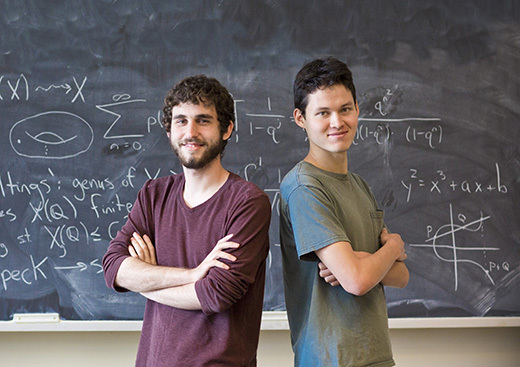 Emory College math majors Noam Kantor (left) and Ethan Alwaise are recipients of the Goldwater Scholarship, the nation’s premier scholarship for undergraduates studying math, natural sciences and engineering. For the second time in two years, the nation’s premier scholarship for undergraduates studying math, natural sciences and engineering has been awarded to an Emory College math major. Ethan Alwaise from Poughkeepsie, New York, was named a 2016 Goldwater Scholar. Noam Kantor, from Clayton, Missouri, was selected as a Goldwater Scholar in 2015. Both students are now seniors. Both students are also focused on number theory, the branch of mathematics that works to discover interesting and unexpected relationships between different sorts of numbers and to prove that these relationships are true. “They're both infectiously excited about mathematics, singularly capable and prodigious, very active within the department, and fantastically fun to have as students,” says David Zureick-Brown, an arithmetic geometer who has worked with both students as an assistant professor in Emory College’s Department of Mathematics and Computer Science. Congress established the scholarship to honor the late U.S. Sen. Barry Goldwater, with the aim of identifying students of outstanding ability and promise, and encouraging them to pursue advanced study and research careers. Scholars receive up to $7,500 per year, until they earn their undergraduate degrees, to go toward the cost of tuition, fees, books, and room and board. A Woodruff Scholar, Kantor began taking graduate mathematics courses as a sophomore and had the unusual honor of publishing a paper as an undergraduate, on shapes called elliptic curves, with Jeremy Rouse at Wake Forest University. Kantor is now at the level of preparation for a third year doctoral student, says Zureick-Brown, and will earn his dual bachelor’s and master’s in 2017 with a thesis expected to result in two or even three publications. Kantor, who was almost entirely self-taught before coming to Emory, has juggled that work while also being active with Hillel and the Inter-Religious Council and occasionally writing for the Emory Wheel. He intends to pursue a doctoral degree in math, with plans to continue his research while also teaching. “I want to continue thinking about number theory and geometry,” says Kantor, who also participated in the Budapest Semesters in Math. “Elliptic curves are a great example of why I love math: they combine number theory and geometry, and they are very important in the modern tech world,” he adds, noting that the challenge of finding specific points on the curve means better security for data from credit card companies, Internet vendors and the like. Alwaise, a Prentice Miller Scholar, is also interested in number theory but plans to work in an area known as moonshine. The field is at the interface of pure mathematics and physics, says Ken Ono, the Asa Griggs Candler Professor of Mathematics and internationally recognized number theorist who has worked with Alwaise since his freshman year. Ono says Alwaise published his first paper after taking Ono’s undergraduate research course. He went on to participate in the summer research program at Oregon State University with Holly Swisher — who like Rouse earned her PhD under Ono — and published his second paper on integer partitions. A partition is any way a natural number can be broken down. So taking the whole number 3, it can be written as 1+2=3, or 1+1+1=3. Alwaise, who serves as a math tutor on campus and is a member of Active Minds, the Sexual Assault Peer Advocates and the Philosophy Club, says the appeal of his work is finding the complex physics implications to the seemingly simple calculations. In addition to Alwaise’s recognition, two Emory College students also received honorable mentions for 2016 Goldwater Scholarships. Joan Shang, a senior majoring in biology, plans to complete a PhD in cancer biology and conduct research on molecular mechanisms of cancer, and also teach at the university level. Tristan Yates, a junior majoring in neuroscience and behavioral biology, plans to complete a doctoral degree in neuroscience and continue research work on neurodevelopment disabilities such as autism.